With 365 days on the calendar, there are only so many holidays you can fit into a year—but on social media, you can always find a reason to celebrate. Over the last few years, we’ve seen a surge in the number of quirky and sincere holidays both big and small, quirky and sincere. In January alone, we counted eight of these so-called Hashtag Holidays. There’s a day for everyone, whether you’re a community manager, a science fiction fanatic or just another cheese lover. Brands can leverage the conversations around the holidays most relevant to them to supplement their social media strategy and join in on the fun. For example, celebrating Random Acts of Kindness Day might make sense for a nonprofit, or for a company that wants to recognize its social followers with a giveaway. Yo-Yo Day, however, might be a better fit for a toy store. With the wide range of holidays to choose from, marketers can integrate the most relevant holidays into their calendars early so they don’t miss an opportunity to hop on a trending hashtag. 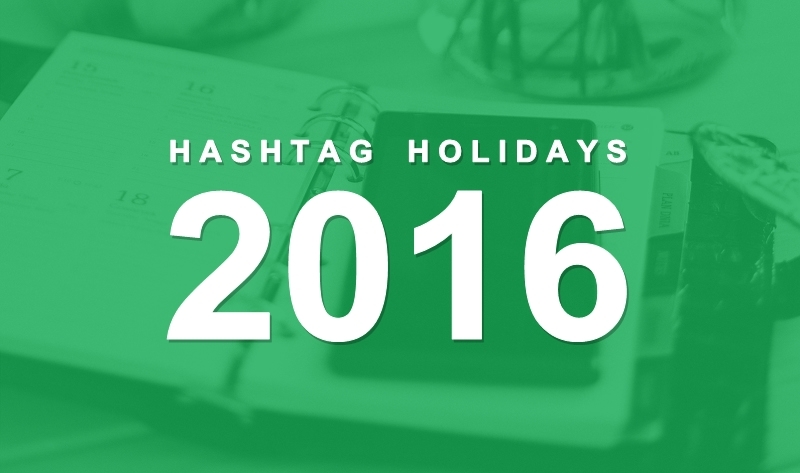 To help you navigate this year’s social media-wide celebrations, Sprout Social has created a 2016 calendar listing some of our favorite holidays. We hope it will be a valuable resource as you populate your content calendars throughout the year.